Immunohistochemistry, is a special staining process performed on tissue removed during biopsy. Immunohistochemistry for lung cancer represents an important complementary tool for the routine diagnosis of lung cancer and for the identification of the different histological types and prognostic factors. 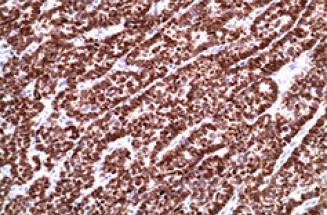 We offer panel of IHC markers: TTF 1, p63, Ck 7, Ck 5/6, Napsin, Chromogranin and Ck 20.